At Bingham-Lester Dentistry, we provide quality dental services for patients in and around Gambrills, MD. Routine dental care is crucial for children, teens, adults, and seniors. Children, even infants and toddlers, need to follow proper oral hygiene of the teeth and gums. Dr. Bingham-Lester offers pediatric dental care for children of all ages. Establishing a good dental care regimen at an early age is important. For parents of infants, the baby’s gums should be wiped to remove milk or food residue. This can be done even before the first tooth erupts. It allows the baby to get used to having his/her mouth cleaned and keeps the gums healthy. Once the first tooth erupts, more traditional care begins. This includes brushing the teeth twice a day and flossing daily. Developing good habits early increases the likelihood that children will actively participate in the routines to maintain the health of their teeth and gums. This keeps children on track for good oral health. The goal is to make oral hygiene a way of life for the child. As soon as the first tooth erupts, children are able to start seeing a dentist. During the early years, this establishes and sets the stage for future dental care. 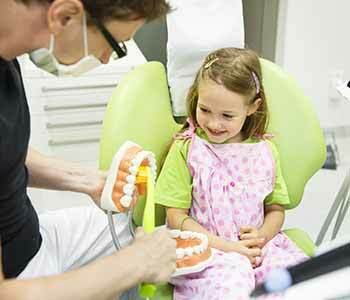 The visits allow the child to become comfortable with the dentist, dental team, and the environment. Familiarity is established as the child gets acquainted with the team, tools, and surroundings. Our team wants to create a positive, comfortable atmosphere built upon a relationship of trust. Contact our team in Gambrills, MD to schedule appointments for your entire family. Call 410-885-6522.